Corporate account Executives have to perform various duties and responsibilities depending on the organization they are into managing the corporate account functions of the company, The Corporate Account Executive Resume sample mentions some duties like account planning, working with clients, negotiating contracts, evaluating the financial aspects of the business development and to analyze market trends and keep the management informed of the same. Some of the job assets that hiring employers looks for in a corporate account executive includes – leadership, logical judgment, problem-solving orientation and computer proficiency. A degree in accounting or marketing or finance or its related field is required for this job role. Headline : A Senior Corporate Account Executive with 6 years of experience, who combines excellent problem solving and interpersonal communication skills with a proven ability to build meaningful and successful relationships. Highly organized multi-tasker, with strong leadership, creative and decision-making skills, who thrives in fast-paced environments. Motivated self-starter, with a drive to build new professional relationships while also strengthening existing ones. Solicited businesses, corporations, and institutions to secure media underwriting ranging in size from $500 to $50,000. Identified and qualified potential new clients and worked with business leaders and decision makers to generate approximately $1 million in new and renewed investment for OPB. Built effective relationships with the corporate, government and foundation executive and program staff, facilitating discussions of financing, strategic marketing and shared organizational goals. Developed cultivation and communication strategies to secure initial and subsequent client meetings, prepared more than 15 written proposals per month and made media presentations in face-to-face meetings. Responded to the client requests and questions in a timely and professional manner. Engaged in quarterly steering committee meetings to discuss the current market trends observed from the alternate organizational viewpoints, which drove new solicitation strategies built to suit specific business markets. Wrote radio, television and online tile ad copy, designed and storyboarded television promos, approved on-air media announcements. Worked with the OPB staff to ensure these announcements were correct and that clients acknowledged media buys and kept clients informed of the OPB activities through meetings and scheduled email and mailed communications. Acted as a liaison and firewall between the members of OPBs media team and clients. 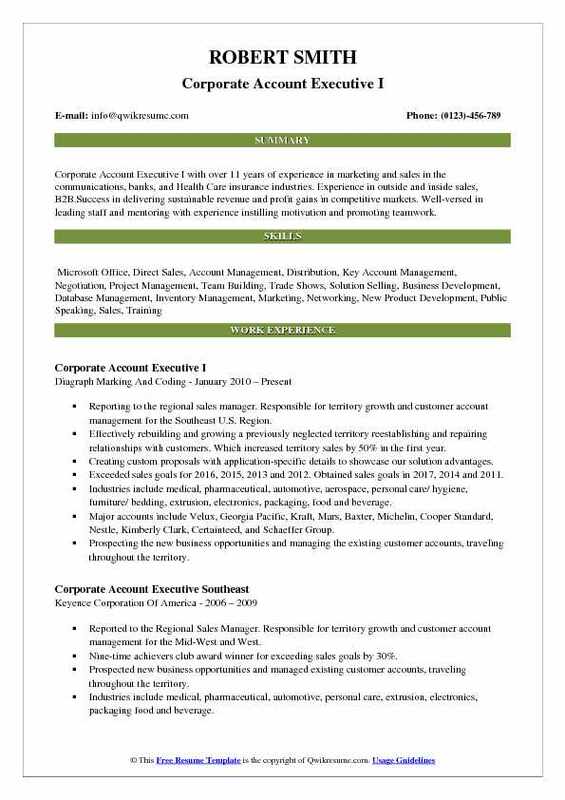 Summary : Exceptional Corporate Account Executive with 7 years of experience in the Logistics domain, who consistently drives sales, cultivates and nurtures relationships, and looks for ways to earn long-term business partnerships. Skills : AS400, Mercurygate, Banyan, and Power Broker. CRM Applications: Microsoft Dynamics, SalesForce, and Pipedrive. Responsible for new business development, managed and closed the complex sales-cycles for AFN’s corporate and enterprise accounts. Identified the sales opportunities, developed customer transportation requirements and customized the transportation management solutions to meet the customer needs. Oversaw and drove AFN’s LTL, truckload, and intermodal departments through strategic internal and external partnerships to drive sales, revenue and gross margin. Corporate development initiatives to include crm (salesforce) implementation. 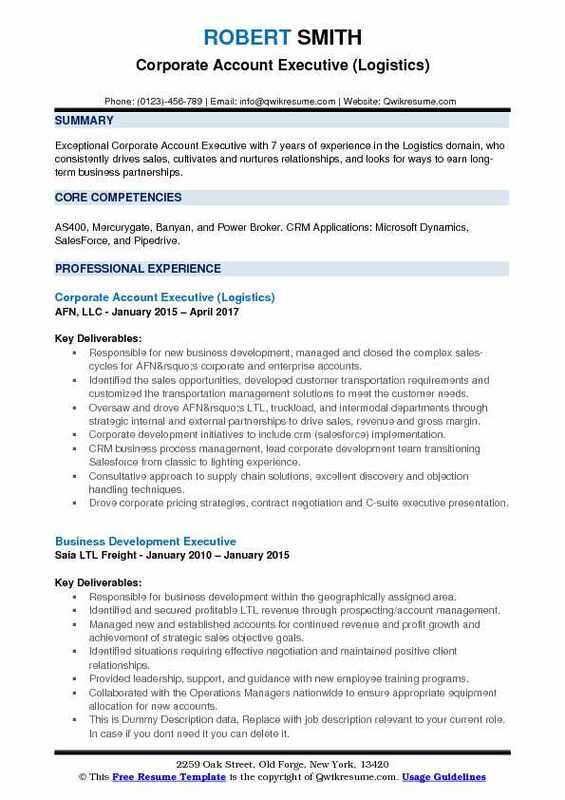 CRM business process management, lead corporate development team transitioning Salesforce from classic to lighting experience. Consultative approach to supply chain solutions, excellent discovery and objection handling techniques. Drove corporate pricing strategies, contract negotiation and C-suite executive presentation. Regularly reviewed, and suggested, revised pricing to sales and executive teams for existing outsourced customers. Sales management/reporting, budgets, forecasts, pipelines, promotions, monthly account data through Salesforce CRM. 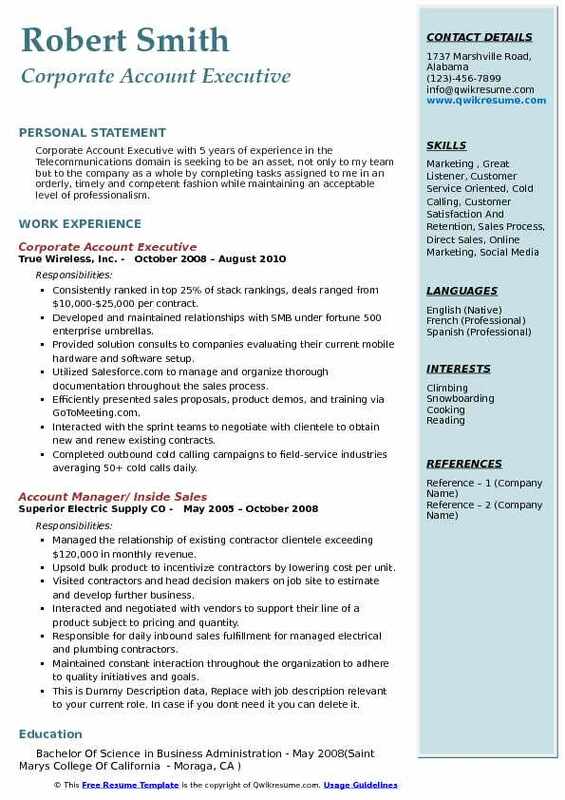 Summary : Corporate Account Executive I with over 11 years of experience in marketing and sales in the communications, banks, and Health Care insurance industries. Experience in outside and inside sales, B2B.Success in delivering sustainable revenue and profit gains in competitive markets. Well-versed in leading staff and mentoring with experience instilling motivation and promoting teamwork. Reporting to the regional sales manager. Responsible for territory growth and customer account management for the Southeast U.S. Region. Effectively rebuilding and growing a previously neglected territory reestablishing and repairing relationships with customers. Which increased territory sales by 50% in the first year. Creating custom proposals with application-specific details to showcase our solution advantages. Exceeded sales goals for 2016, 2015, 2013 and 2012. Obtained sales goals in 2017, 2014 and 2011. Industries include medical, pharmaceutical, automotive, aerospace, personal care/ hygiene, furniture/ bedding, extrusion, electronics, packaging, food and beverage. Major accounts include Velux, Georgia Pacific, Kraft, Mars, Baxter, Michelin, Cooper Standard, Nestle, Kimberly Clark, Certainteed, and Schaeffer Group. Prospecting the new business opportunities and managing the existing customer accounts, traveling throughout the territory. Utilizing the CRM database to accurately forecast sales on a monthly basis, demonstrating an entire line of products, services and software. 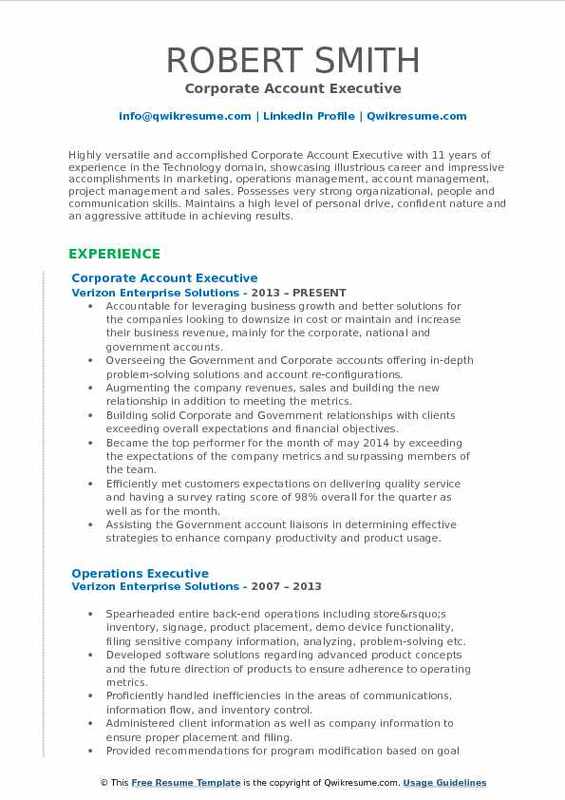 Summary : Highly versatile and accomplished Corporate Account Executive with 11 years of experience in the Technology domain, showcasing illustrious career and impressive accomplishments in marketing, operations management, account management, project management and sales. Possesses very strong organizational, people and communication skills. Maintains a high level of personal drive, confident nature and an aggressive attitude in achieving results. Accountable for leveraging business growth and better solutions for the companies looking to downsize in cost or maintain and increase their business revenue, mainly for the corporate, national and government accounts. Overseeing the Government and Corporate accounts offering in-depth problem-solving solutions and account re-configurations. Augmenting the company revenues, sales and building the new relationship in addition to meeting the metrics. Building solid Corporate and Government relationships with clients exceeding overall expectations and financial objectives. Became the top performer for the month of may 2014 by exceeding the expectations of the company metrics and surpassing members of the team. Efficiently met customers expectations on delivering quality service and having a survey rating score of 98% overall for the quarter as well as for the month. Assisting the Government account liaisons in determining effective strategies to enhance company productivity and product usage. Received ‘Shining Star Rewards’ from the Supervisors and Associate Directors for outstanding customer account management and appreciation from the clients themselves. Member of the team which succeeded in achieving the highest NPS (customer feedback) where the goal was 72% and received around 85­90% rating for the entire year leading up to November. 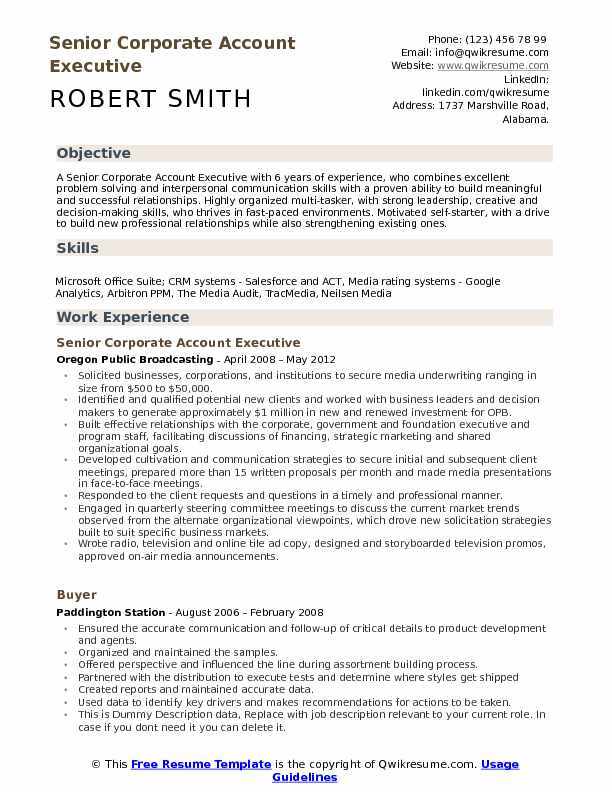 Headline : Corporate Account Executive with 5 years of experience in the Telecommunications domain is seeking to be an asset, not only to my team but to the company as a whole by completing tasks assigned to me in an orderly, timely and competent fashion while maintaining an acceptable level of professionalism. Consistently ranked in top 25% of stack rankings, deals ranged from $10,000-$25,000 per contract. Developed and maintained relationships with SMB under fortune 500 enterprise umbrellas. Provided solution consults to companies evaluating their current mobile hardware and software setup. Utilized Salesforce.com to manage and organize thorough documentation throughout the sales process. Efficiently presented sales proposals, product demos, and training via GoToMeeting.com. Interacted with the sprint teams to negotiate with clientele to obtain new and renew existing contracts. Completed outbound cold calling campaigns to field-service industries averaging 50+ cold calls daily. Attended and hosted trade show booths to present M2M and field solutions. Promoted and sold products and services to current and prospective customers. Analyzed the market's potential, tracked sales, and forecasted surpasses quotas and quarterly sales projections. 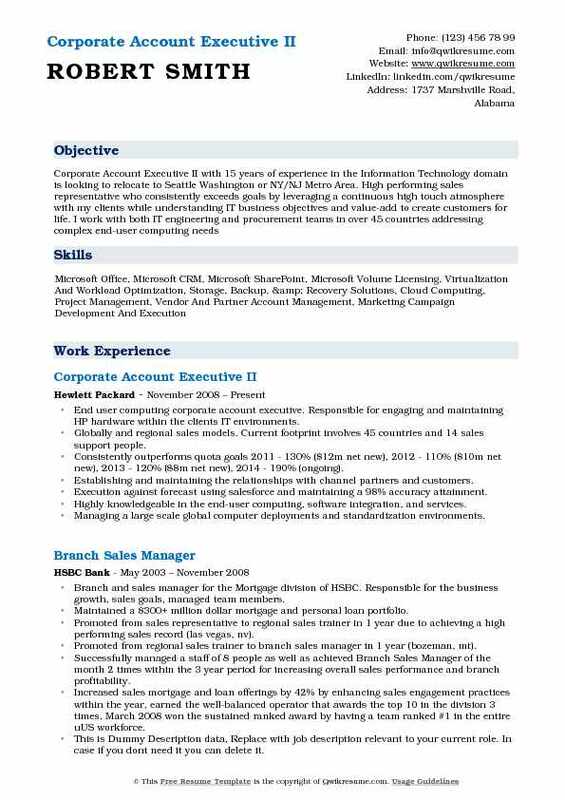 End user computing corporate account executive. Responsible for engaging and maintaining HP hardware within the client's IT environments. Globally and regional sales models. Current footprint involves 45 countries and 14 sales support people. Consistently outperforms quota goals: 2011 - 130% ($12m net new), 2012 - 110% ($10m net new), 2013 - 120% ($8m net new), 2014 - 190% (ongoing). Establishing and maintaining the relationships with channel partners and customers. Execution against forecast using salesforce and maintaining a 98% accuracy attainment. Highly knowledgeable in the end-user computing, software integration, and services. Managing a large scale global computer deployments and standardization environments. Team lead who is a champion for services, product, and sales processes. Maximizing the market effectiveness by extending reach for promotional prices through webinars. Constant account mapping/managing and time management to ensure satisfaction and constant growth. 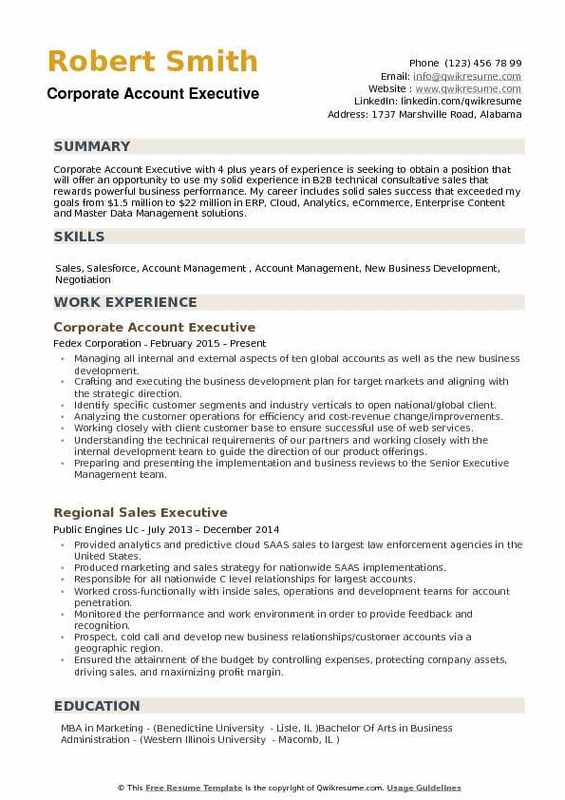 Headline : Corporate Account Executive with 5 years of experience in the Finance domain is seeking to obtain a position at a company with the high organizational direction that will benefit from sales experience, positive interaction skills and industry contacts acquired from five years experience, thereby ensuring sales results. Achieved sales goals of $20mm annually, as a remote employee, by working existing client base for additional business as well as establishing new customer accounts. Field incoming phone calls from customers, service their needs for new leases, questions on existing portfolio, quoting, pricing and locating equipment. Responsible for the pre-termination contact, disposition details and operational notification to both accounting and billing departments respective to all assigned mature accounts. Closely monitored and reported on the competitor activities, marketplace concerns and other activities which could impact the company in the market area. Obtained a required trade, credit, and financial information credit applicants and prepared a credit overview of each new sales opportunity. Basic knowledge of the interpretation of financial statements, balance sheets, profit/loss and income statements required for completion of the Management approval documentation. Contacted the existing customers at 90-day intervals for additional business. 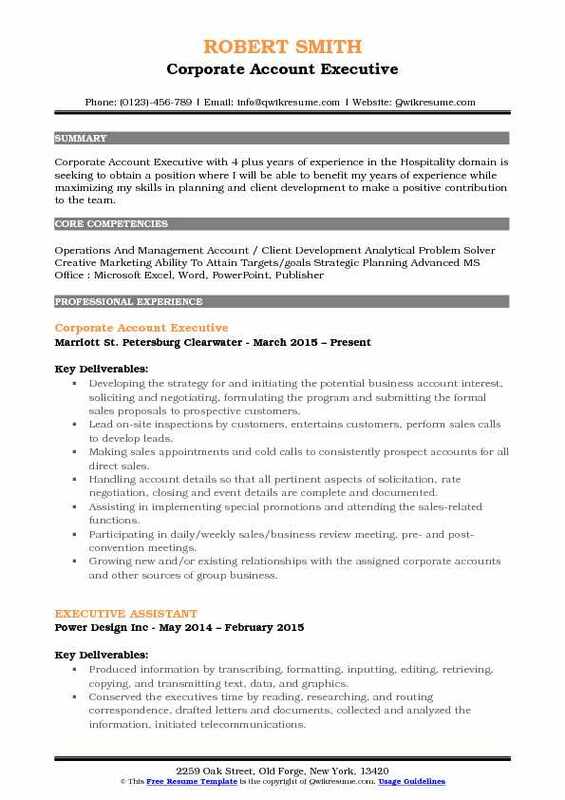 Objective : Corporate Account Executive with 4 plus years of experience in the Hospitality domain is seeking to obtain a position where I will be able to benefit my years of experience while maximizing my skills in planning and client development to make a positive contribution to the team. Developing the strategy for and initiating the potential business account interest, soliciting and negotiating, formulating the program and submitting the formal sales proposals to prospective customers. Lead on-site inspections by customers, entertains customers, perform sales calls to develop leads. Making sales appointments and cold calls to consistently prospect accounts for all direct sales. Handling account details so that all pertinent aspects of solicitation, rate negotiation, closing and event details are complete and documented. Assisting in implementing special promotions and attending the sales-related functions. Participating in daily/weekly sales/business review meeting, pre- and post-convention meetings. Growing new and/or existing relationships with the assigned corporate accounts and other sources of group business. Responsible for analyzing spend and negotiating terms and conditions for contracts. Summary : Experienced and accomplished Corporate Account Executive with over 10 years of proven success in the Food domain. Possess extensive background in management and strong customer service skills with leadership abilities by providing strategic and innovative direction to team. Possess analytical and organizational skills with a high degree of integrity, flexibility and willingness to embrace change. Able to excel in a fast-paced, high volume environment and multi-task with attention to detail. Conatcting and acquiring new and existing regional accounts with an average of $500,000 in sales per month with a 15-18% median profit margin. Developing an annual business plan in conjunction with the Upper Management, detailing activities to follow during the fiscal year. 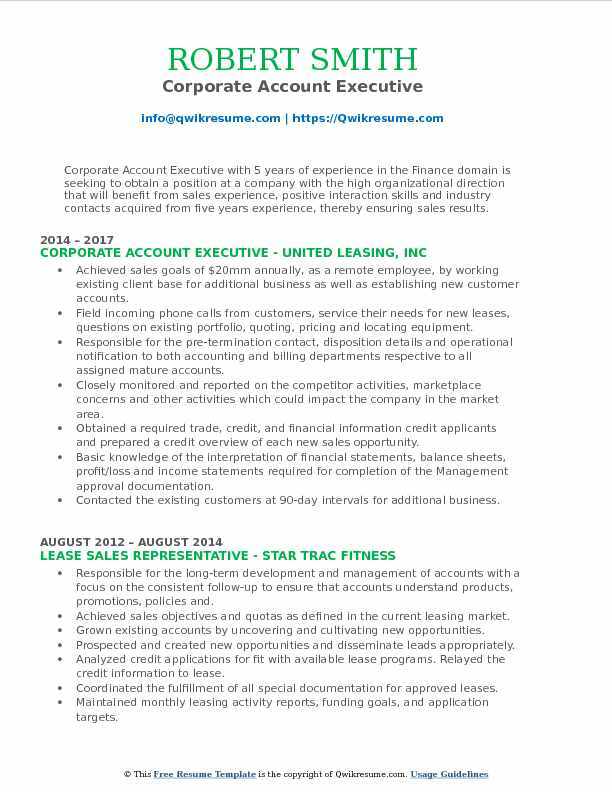 Strong background in sales associate training with focus on meeting and/or exceeding sales quota. Demonstrating the ability to carry on a business communication with all levels within infrastructure including key decision makers. Maximizing all opportunities in the process of closing strategic sales resulting in gaining of larger market share from major competitors. Developing a database of qualified leads through referrals, telephone canvassing, face-to-face interaction, cold calling on business owners, direct mail, email, and networking. Maintaining accurate records of all sales and prospecting activities including sales calls, presentations, closed sales, and follow-up activities within the assigned territory, including the use of Microsoft Office suite tools to maintain accurate records to maximize territory potential. Working with the customers to understand their business issues and providing solutions to meet their needs and growing their business. Objective : Corporate Account Executive with 4 plus years of experience is seeking to obtain a position that will offer an opportunity to use my solid experience in B2B technical consultative sales that rewards powerful business performance. 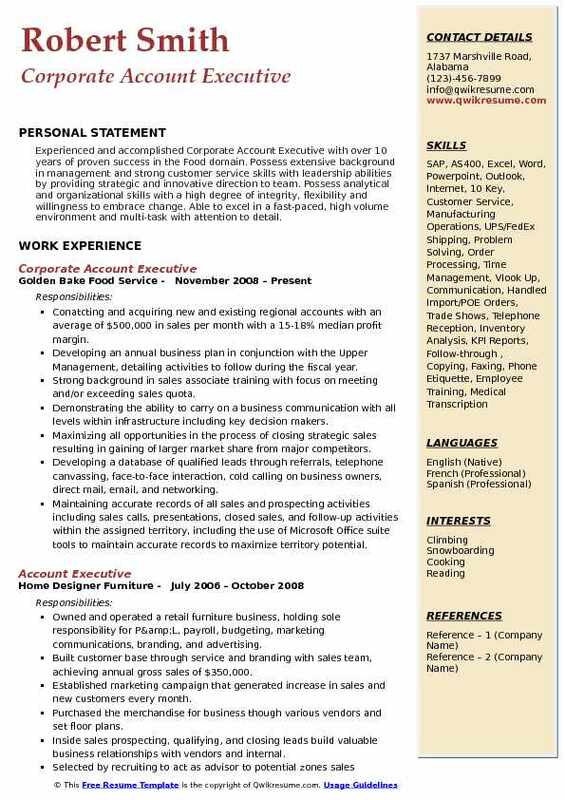 My career includes solid sales success that exceeded my goals from $1.5 million to $22 million in ERP, Cloud, Analytics, eCommerce, Enterprise Content and Master Data Management solutions. Managing all internal and external aspects of ten global accounts as well as the new business development. Crafting and executing the business development plan for target markets and aligning with the strategic direction. Identify specific customer segments and industry verticals to open national/global client. Analyzing the customer operations for efficiency and cost-revenue change/improvements. Working closely with client customer base to ensure successful use of web services. Understanding the technical requirements of our partners and working closely with the internal development team to guide the direction of our product offerings. Preparing and presenting the implementation and business reviews to the Senior Executive Management team. Managing the complex contract negotiations and serving as a liaison to the Legal group.